Follow a little red ball through this super fun pegboard wall mounted adventure. 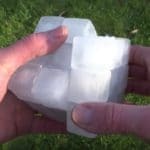 Inspired by Biisuke Ball and Magnets and Marbles, two instant internet video classics, YouTuber Steve Price of Sprice Machines created this complex chain reaction screen link video. If you’re interested in creating and testing your own chain reaction marble runs, wooden pegboards make for excellent setups. Follow this video with Murmelwelt’s Cuboro/Cugolino “big ball” marble run and a Japanese ‘Pythagoras Switch’ Rube Goldberg Machine for charity.